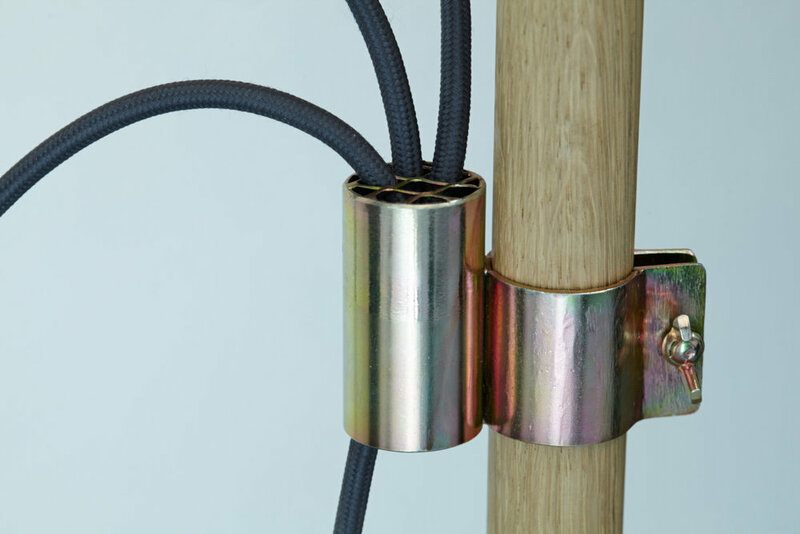 The Guinea floor lamp explores the aesthetics of bricolage, pairing natural materials such as stone and wood with metal that has undergone ‘tropicalization’, a special process that gives metal a characteristic rainbow nuance. Guinea has a particularly strong exotic reference. The lamp shades are inspired by palms and tropical colours. The base of the lamp is a block of untreated Portoro marble. Each block is chosen individually, to ensure that every base is unique. The lamp stem is made from oiled oak and the lamp shades are made from triple layered, hand pleated organza. The heights are adjustable vertically.